Sciatica from spinal stenosis is one of the many possible consequences of both central canal and foraminal narrowing. Sciatica is often misidentified as a separate diagnosis, when actually, it is just a set of symptoms of another root underlying condition. If a doctor diagnoses you with sciatica, I advise you to seek treatment elsewhere, since they are obviously not very enlightened when it comes to back and leg pain. For those who do not know, sciatica describes a set of symptoms which exist in the lower body, including radiating pain, tingling, weakness and/or numbness in the buttocks, legs, feet and/or toes due to a spinal source. 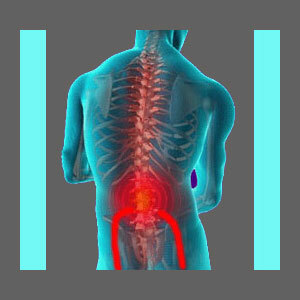 Pseudo-sciatica describes an identical set of symptoms which comes from a purely non-spinal source. This discussion centers on the relationship between various types of spinal stenosis and the occurrence of sciatica symptoms in the lower body. Sciatica can be caused by central spinal stenosis and neuroforaminal stenosis. In central canal stenosis patients, the causative issue can exist virtually anywhere in the spine, including the cervical region, the thoracic region or the lumbar region. Central stenosis sufferers will often have sciatica which is widespread and highly symptomatic in the entire lower body, possibly including the incidence of tripping often or not being able to stand for very long. Meanwhile, foraminal stenosis sufferers will have much more focused sciatica concerns in limited areas of the anatomy, based on the possibilities for each nerve root affected. Remember that the sciatic nerve is made up from nerve roots at 5 different vertebral levels, so a single pinched nerve will only affect a small area of the lower body in a very definite symptomatic pattern. Learn everything about the causes, symptoms and diagnosis of sciatica, as well as how to find effective treatment on Sciatica-Pain.Org. Sciatica symptoms can certainly come from any number of structural sources, including herniated discs, osteoarthritis, spinal curvature and spondylolisthesis. However, in a great number of cases, the pain is actually nonstructural in origin and is usually enacted by disease, diabetes or oxygen deprivation of the nerve roots or fully formed sciatic nerve itself. This helps to explain why some patients with minor stenosis, arthritic change or disc issues have terrible sciatica, and furthermore, why treatments for said issues rarely solve the pain problem. I see many cases of diagnosed pinched nerves, particularly due to herniated discs, where the pain and neurological symptoms are far too wide ranging and diverse to ever come from a single level compressive neuropathy condition. The diagnosis is made nonetheless, mostly due to the strong desire of some greedy doctors to get the patient into expensive treatment, regardless of the poor outlook for curative results. Disgusting. The alternate explanation is simple ignorance, which is no better than greed. Remember that sciatica is a symptom set, not a condition unto itself. This is step one. Next, remember that neurologists offer the best hope of correctly diagnosing the underlying reason for sciatic nerve pain to exist and to correlate the symptoms correctly. Spinal stenosis can be the source of sciatica symptoms regardless of where the canal narrowing occurs. Keep this in mind if you have been diagnosed with sciatica due to some coincidental lumbar condition, but have not found relief. Many, many patients actually have yet undiscovered severe cervical spinal stenosis as the real source. This is unfortunately rarely found out until after a failed surgery is performed on the lower back.